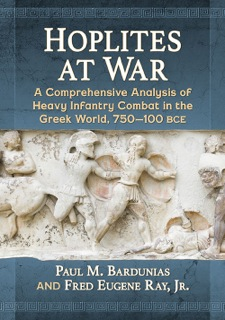 My book Hoplites at War with Fred Ray will be coming out this fall. 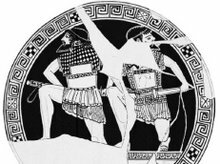 When Push Comes to Shove: What Was the "Othismos" of Hoplite Combat? There are serious flaws with his analysis and even more with his presentation. He contacted me early on in his studies, and in the interest of full disclosure I must tell that myself and few others attempted to steer him away from the mistaken path he was on. 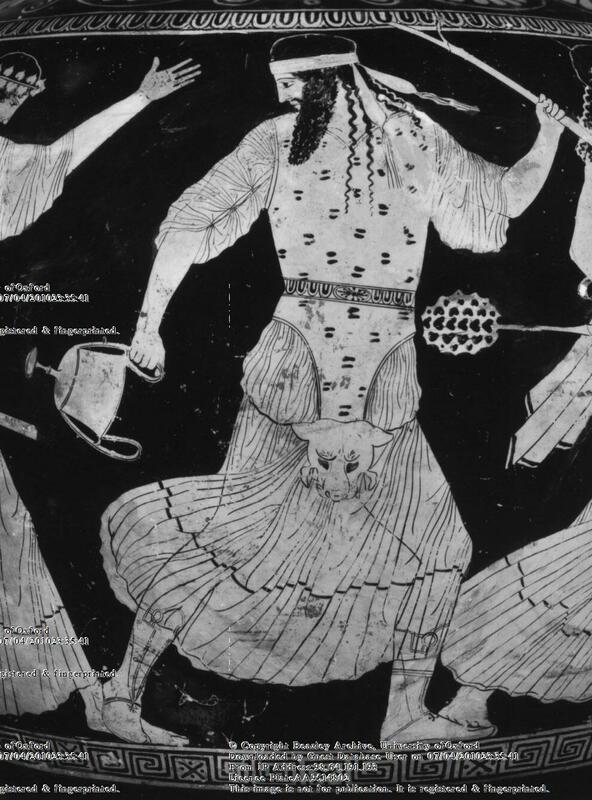 I have been largely away from Ancient Greek topics for over a year now due to other demands on my time, but now that I have come back I am finding far too many online discussions where his portrayal of hoplite combat has taken root. I am loathe to enter into what must be a deconstruction of his thesis because he is a dedicated reenactor of ancient hoplites. For years I have been suggesting that he is exactly the type of researcher that those writing histories of Greek combat must heed. Reenactment can be, when done well, experimental archaeology. When it is it must conform to the ethics of a scientific experiment and honestly assess alternate views. In this Mathew's work fails. I assume these are honest mistakes, scientists make them all the time, but the bias he brings to his analysis is all too glaring in his presentation. 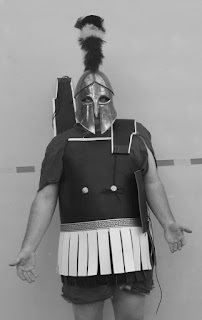 When his book came out, the general consensus I received from the many hoplite reenactors I correspond with was that the analysis in Storm of Spears was flawed based on their experience and his notions failed to convince the hoplites at the Marathon gathering. I had hoped that by now members of these other groups would have shot down the mistaken ideas, but I see now that perhaps they do not have the reach to disseminate their ideas as efficiently as Mathew does. I am not sure that I do either, but I will give it a try. I will note that I have no financial tie to these books, but I did give some advice on certain topics. Matthew’s analysis of artistic portrayals in support of his core theory that hoplites within classical phalanxes did not normally engage in shock combat using over-arm strikes with their primary weapon (the thrusting spear) appears to be fundamentally flawed. One can readily accept his contention (p. 20) that a majority of the figures evaluated (an estimated 243 [71%] out of a sample of 340 in which the grip could be determined) show a weapon with a centrally located point of balance. One can also easily buy the assertion (p. 21-23) that these devices are much more suitable for throwing than the sort of thrusting spears designed for shock combat that were common to classical phalanx battle. These latter favored a rearward grip (p. 8-11). Such ideas find further backing from the information cited on length in which the data sub-set of weapons held overhead (and dominated by central grips) has a notably shorter average (p. 23-24). This is consistent with devices that can be thrown effectively and contrasts with longer averages for sub-sets dominated by weapons having rearward grips and therefore better suited to thrusting (p. 14). The observation offered that sauroters best associated with simple thrusting spears (p. 4-5) are more common on images of longer/rear-grip weapons (p. 22) also backs this argument. Matthew’s proposal (p. 31-33) that a majority of the images in the artistic record portray archaic or mythological figures using weapons other than single-purpose thrusting spears thus appears sound. However, while this bodes well for his contentions (p. 23, 38) that past evaluations treating these weapons solely as thrusting spears are likely in error, it does not lend support to his linked assertion (p. 38) that essentially all fighting with the thrusting spear used under-arm methods. Indeed, the image data presented actually appear to disprove that particular concept. Accepting that an apparent 243 (86% of the 60% fraction held over-arm plus half of the 40% fraction held under-arm [p. 16]) among useable images involve center-grip weapons other than those traditionally employed in classical era shock action, only analysis of the remaining 97 figures (those with rearward grips indicative of a single-purpose thrusting spear) are relevant to the frequency of hand-to-hand techniques used by classical Greek spearmen. Of these, 29 (30%) display an over-arm grip while 68 (70%) show an under-arm grip. Given that an over-arm grip would have no real value outside of its possible employment in shock combat, every image showing that approach with a simple thrusting spear (unsuitable as a missile) must therefore have been meant to portray a man engaging in (or preparing to engage in) shock fighting. But figures displaying an under-arm grip could well be doing something else - advancing while putting minimal stress on the spear-arm or resting that arm during a lull in battle for example. This meshes with Matthew’s simulation data (p. 122-125) that shows an under-arm pose to be less tiring during combat. Also agreeing, if we discount the possibility (though it is strong in my opinion) that the antique, center-grip weapons might be dual-purpose spears useful for shock combat and are instead solely missile weapons, is that those 68 figures holding center-grip weapons under-arm (28% of the center-grip total) must be resting their throwing-arm in a similar fashion. This means that we can count only those figures with an under-arm grip that are also shown in the very midst of a shock fight as truly secure examples of under-arm thrusting. Unfortunately, we are given no value for this (or a table of rawer information from which it might be derived). As a result, given only the image data provided by Matthew, one must conclude that an over-arm technique for shock combat appears at least 30% of the time (that value being the case should all of the images with under-arm grips describe ongoing shock actions). And this could rise to as high as 100% (in the highly unlikely case that none of the under-arm images show ongoing shock actions). Therefore, with a technically possible 30-100% range for its portrayal, the over-arm method for spear-fighting appears to find rather convincing support within the artistic record as presented by Matthews, instead of being completely ruled out as he asserts. We should further consider that even the foregoing rather more “over-arm friendly” view of the artistic record might underestimate the frequency of that method’s true employment. This is because very few (if any) of the studied images are likely to be portraying the “othismos” stage of phalanx combat in the “literal” (i.e. physical) sense. Here, hoplites would have been pressed “belly-to-back” in a manner unsuited for the side-on views commonly employed in ancient artworks. And an over-arm utilization of the thrusting spear might well be the most practical method during othismos. There is wide acceptance that such literal othismos is explicitly referenced in several of our most detailed descriptions of phalanx battles (per Matthew’s note on p. 237). And though Matthew considers it rare on the basis of these being few in number, it remains likely (in my opinion) that similar episodes of literal othismos developed in a much higher count of more poorly documented actions featuring similar tactical dynamics. Here are links to other articles I have written for Ancient Warfare. This was the original presentation of the crowd-othismos. As you can see in the last article this concept has matured. 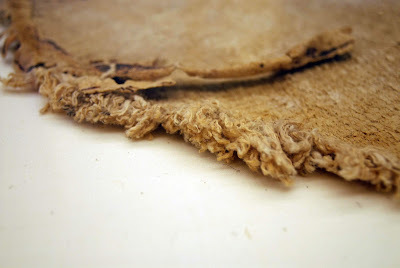 I compiled all the evidence I could find for both Linen and Leather as the material used in the "linothorax." This was a labor of love. An article on Xanthippus of Sparta whose leadership halted the advance of a nascent Rome and left a lesson for Hannibal on how to destroy a Roman army. 'Regulus' demise'. Illustrated by Carlos de la Rocha and Igor Dzis. The fate of nations is often decided on battlefields and the course of battles may be decided before they are fought by the tactical genius of great generals. History's foremost military commanders led their people to conquest or fought to stave off being conquered. They fought as usurpers or championed freedom and spread ideologies. Rarely in history have leaders altered the course of history solely for that purest of motives: profit. Xanthippus of Sparta was one such man. Over the last half century, a schism developed over hoplite combat that has devolved into a bellum sacrum, with an orthodoxy assailed by an increasingly popular heresy. The orthodox position, championed by Hanson, Luginbill, and Schwartz, portrays hoplites as lumbering masses of men that charged directly into each other and contested the battlefield by attempting to physically push their foes. Van Wees, Krentz, and Goldsworthy, describe hoplites as closer to skirmishers, fighting in an opened order, and often paired with missile troops. Any “push” was either a figurative description or uncoordinated shield-bashing. I believe they are both in some measure correct, and often equally wrong, because this debate has forced historians to stray far from their fields of study. Their arguments suffer from an insufficient understanding of the physics and mechanics of large masses or crowds. Group behavior is my field, and, with the context that I can provide for their arguments, I shall make an attempt at syncretism. Herodotus, writing in the mid 5th century, was the first author to describe the heavy infantry of ancient Greece as hoplites, or men who were considered fully equipped for battle. In his day, a hoplite’s arms and armor, his panoply, might have included a bronze helmet, greaves, a bronze cuirasse or corslet of leather or textile, and an iron sword. A rich man might add bronze thigh, upper arm, ankle, and even toe guards. The only pieces that seemed to have been required were the large, round shield or aspis and a 1.8-2.5 m thrusting spear. Herodotus contrasts hoplites with psiloi, literally “naked”, armed with missile weapons. By the time Herodotus wrote, hoplites fought in a formation termed a phalanx by modern authors, following Homer’s use of the term in relation to massed combat. The panoply of the hoplite emerged in the late 8th century, with the advent of the round, domed, shield and thrusting spear with pointed spear-butts, or sauroters. It has been suggested that these items indicate a break from earlier, skirmishing and missile combat, but aspis bearing hoplites on some early vases, like the Chigi vase (ca. 640), appear to bear a pair of spears with throwing cords attached, a shorter one most likely to be thrown and a second longer spear which could be thrown or used in close combat. By the 5th century, the classical Greek dory, or fighting spear, appears to have been as much as 2.5 m long, but it was effectively longer because a combination of rear weighting and tapering of the shaft moved the center of balance, hence the grip, back to about a third of the way from the bottom. A 2.5 m dory had a reach of over 1.5 m, similar to a 3.3 m mid-balanced spear. The great reach of this spear was a handicap in single combat, because it would be useless if a foe managed to move up shield to shield. A man cannot reach back far enough to bring a point that is 1.5 m from his grip to bear with any force against a foe this close. However, in a battle line, the extra reach enabled hoplites to overlap their spears and support the men beside them. Moving within the reach of the combined spears of a phalanx would be much more difficult than evading any single spear. The shield has also been seen as unsuitable for single combat. The hoplite’s shield, the aspis, hoplon, or perhaps most specifically, Argive aspis, varied little in size or shape over the whole period of hoplite warfare. It was made in the form of a flattened dome, some 10 cm deep, between 90 cm to just over a meter in diameter, including a robust, offset rim of some 4-5 cm. The rim, and often the whole face of the shield were covered in a single sheet of bronze, 0.5- 1 mm thick. The orthodoxy reconstructs this shield as exceptionally heavy (7-9 kg), but Krentz has suggested a more likely 6.8 kg or less. These features are not unique to the Greek shield. A convex shape functions to transfer force away from the site of impact, while an offset rim reinforces the face of the shield so that it does not split when struck. Exceptionally convex shields, conical in profile, are common in many cultures because the profile ensures that an incoming strike will encounter a sloped shield-face. 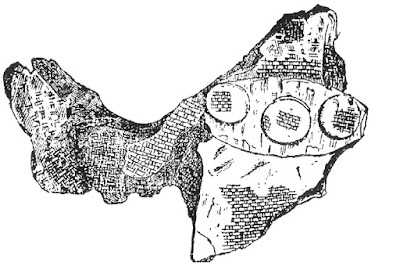 The aspis had an uncommon system of grips that some suggest limited the shield’s utility in single combat to the point that men were forced to fight in close order. The left arm was slipped through a bronze cuff, or porpax, placed either at the shield’s center or just to the right of center. The porpax either accepted a leather sleeve or was itself tapered to accept the forearm up to just below the elbow, and fit like the cuff of a modern artificial limb, holding the limb so snuggly that the shield would not rotate around the forearm. A second grip near the rim of the shield was gripped by the hand, and tension from this grip acted to hold the arm in the porpax. In shields from other cultures that have a double-grip system, the grip for forearm and hand usually flank the center of the shield. This allows most of the shield to be brought up in front of its bearer, while the aspis allows only half the shield to cover a man’s front. The central placement of the porpax in the aspis is an advantage because it makes holding the shield up on the bent forearm easier by reducing the proportion of the shield’s mass that is to the right of the elbow and must be pivoted up. A double-grip limits the range through which a shield can be moved to block. The shield cannot be held as far away from the body as one gripped by the hand, which leaves a greater portion of the body vulnerable to incoming strikes and reduces the distance a strike must penetrate to wound. 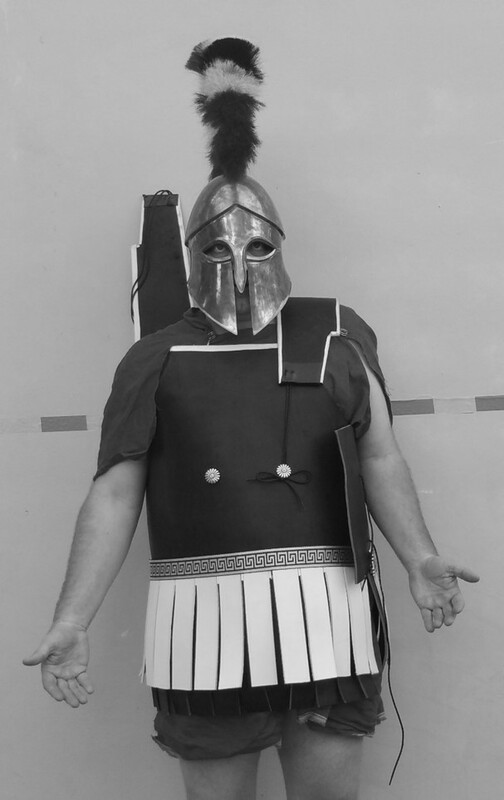 It has been suggested that hoplites could gain coverage by standing perpendicular to shields in a “fencers” stance. This analogy is untenable because fencers lead with their weapon hand, while hoplites would have to come up parallel to their shields to effectively strike with their spears. The aspis has one unique feature that is difficult to explain. 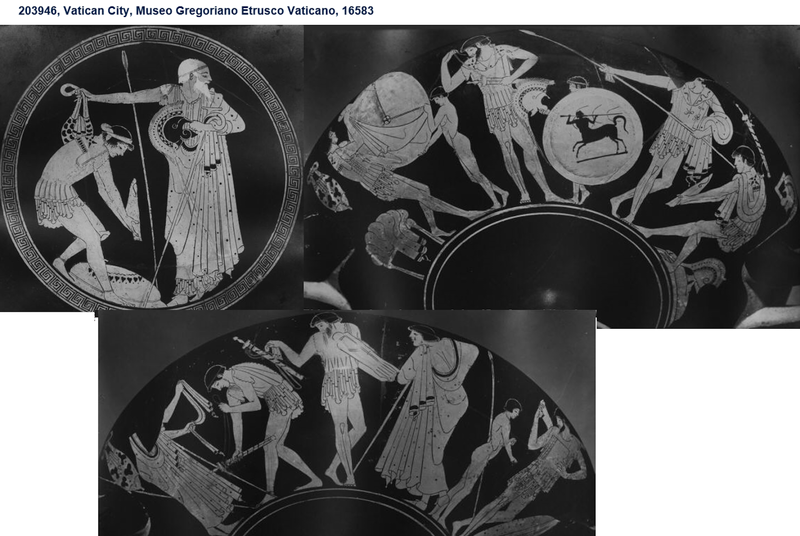 The Bomarzo shield in the Vatican’s Museo Gregoriano Etrusco, which retains large portions of its wooden core, presents an odd picture. The shield’s core is only 5-6 mm thick over much of the shield’s face, thickening to 8 mm in the center where the porpax was affixed. Near the rim of the bowl, the shield curves back sharply to form side-walls of 10-14 mm that taper towards the shield face. A shallow dome tends to spread outward under pressure, and the wide, perpendicular rim acts to keep the face from splitting. Under pressure, an aspis will fail where the side-wall and the face join. This odd profile has inspired the suggestion that the aspis’s great weight required this curve to allow a man to carry the shield on his shoulder. Leaving aside that the aspis’s mass has probably been overestimated, some rough calculations show that this explanation is unlikely. The aspis’s weight did not likely motivate the curved outer portion because, even though only 3-4 cm wide, the greater thickness and large diameter of the “ring” of wood that makes up the side-wall section accounts for 20-40% of the total mass of wood making up the shield-face! Reinforced side-walls could provide added protection against chopping blows by swords, but this would be superfluous given the thick, bronze covered rim. The side-walls appear to add more depth to the shield than strength, a function we will return to later. Modern authors present us with irreconcilable images of how these early aspis-bearers fought. To some there was a “hoplite revolution” and orderly phalanxes either closely follow or predate the new shield. Van Wees describes a “motley crew” of intermingled hoplites, archers, and horsemen that slowly transitions from bands of warriors to the phalanx familiar to 5th century historians. 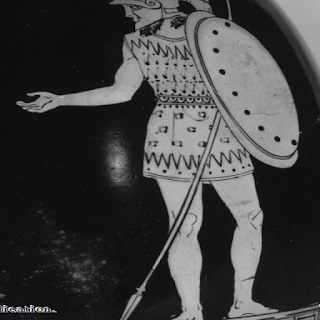 Tyrtaeus, a 7th century Spartan poet, wrote to inspire the warriors of his polis. Two themes run through his works: he chides his audience to stand close to their fellows and to bring the fight to close quarters with their foes. 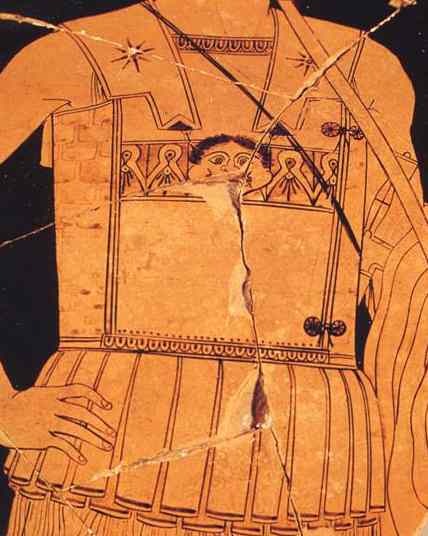 Tyrtaeus can easily be interpreted as a herald for the classical hoplite phalanx, with close ordered ranks and files. But if men were formed in an orderly phalanx, why would the poet need to deride skulkers who remained out of the range of missiles? This dichotomy of order-vs-chaos is a hot topic in the physical sciences, and the boundary between the two has diminished. Order within groups can arise spontaneously from seemingly random acts of individuals. We call this process self-organization. Through this mechanism, swarms, flocks, herds and schools of animals achieve levels of coordinated movement that any human drill master would envy. Swarms, or crowds, of humans are capable of this type of organization as well. If we take van Wees’s “motley crew” and add simple, logical rules like “archers tend to stand behind men with shields” and “men with shields tend to stand beside men with shields to protect their flanks”, then we end up with a formation that resembles the Germanic shield-wall or late Roman foulkon. This type of formation puts more heavily armored men, who may throw missiles themselves, in front of unarmored missile troops to act as a wall or screen. Segregation like this is natural in tribal war bands, where richer, better equipped men lead a troupe of progressively poorer equipped warriors into battle. It would actually take more discipline to keep troop types evenly mixed than to clump in this manner. There is no need for hoplites to form in a particularly opened order to allow men to move freely through such a self-organized group. One advantage of the large diameter of the aspis is that it acted as a literal meter-stick. Men did not need to make any judgment on their frontage beyond lining up shield rim to shield rim. In human crowds, as in schools of fish or flocks of birds, individuals are completely interchangeable. The result is that no one has a specific place in the formation and the group is highly fluid. Men can move to the front line or beyond to throw missiles at the enemy or challenge a foe, then melt back into the group and retire out of combat. Such “milling” is commonly seen in all but the densest of crowds. If the economies of the Greek cities allowed for increasing numbers of warriors and a higher percentage of these were well armed hoplites, then a shift from a few ranks of men acting to shield lighter troops to deep ranks of spearmen who charge swiftly to spear range may simply emerge from the conditions of the battlefield rather than result from an intentional tactical shift. As the number of men increased, additional depth would be easier to coordinate than a widely extended battle line. If the percentage of missile troops dropped low, or the defenses of the hoplites reached a level of protection that charging through an enemies’ missile barrage was less risky than engaging in a missile duel, then the move to an all hoplite phalanx would result. Once hoplites began to form in more than four ranks, missile troops became ineffective. Xenophon (Anabasis 3.3.7) describes the difficulty of bowmen in firing over the ranks of their own hoplites. Increasing the depth of phalanxes is advantageous in close combat for a variety of physical and psychological reasons. The heretical view holds that the ranks beyond the first one or two do not directly participate in battle, but play an important role in supporting the front ranks in battle. Beyond acting as a reserve, ready to step forward over the fallen rankers in front of them, the mere presence of these men behind the front rankers raises the morale of those men fighting. In addition, deep ranks of men formed behind the fighting front limit the ability of those men to turn and run. In orthodox view, all of the ranks run together into battle as a single mass, then crash into the formation of their foes. This physical pushing match, for which the term othismos has been applied, has been likened to a giant rugby scrum, with the goal of pushing the opposing section of the phalanx out of alignment with the rest of the formation until they rout. I believe that a pushing match did occur in hoplite battle, but I am sympathetic to the heretics because the physics of othismos have been misstated by the orthodoxy. Othismos was a noun that derived from the word otheo, a verb meaning “to thrust, push, or shove”. The modern definitions of othismos treat the noun othismos as a verb, for example Liddell and Scott render it as either “thrusting, pushing” or secondarily “jostling, struggling”. As a noun, the word would have to be defined as “a state wherein thrusting, pushing, jostling or struggling occurs”. We commonly call such a state a dense crowd. Perhaps the best English equivalent would be the way we derive a state of dense crowding, a press, from the verb “to press”. This is not a crowd in the sense of many people or a throng, because the Greeks had other words to describe that. It is essentially a traffic term, like jam or deadlock, implying that many individuals are locked together and cannot move past. Crowds can “push” with extreme force, but the word focuses on density, more of a squeeze directed within the group than without. The term “Othismos” had three common uses. First, it is used to describe hoplite battle. Thucydides (4.96.2) describes fierce combat, noting that it is accompanied by “othismos aspedon”. This description has been held up as the clearest evidence for othismos as “pushing with shields”, but perhaps a better reading is a “deadlock of shields”, emphasizing the crowding of the opposing ranks together, with or without pushing. Arrian (Tactica 12.3) used the same word to describe not opposing ranks, but the crowding of second rankers in a phalanx against the backs of the front rankers, after which they can reach the enemy front rankers with their swords. Second, othismos is used is in situations familiar to anyone studying crowd disasters. In the worst of these, people are asphyxiated or squeezed either hard enough or long enough to cause them to lose consciousness or die because pressure on their chest and diaphragm prevents them from breathing. Xenophon (A. 5.2.17), Plutarch (Brutus 18.1), and Appian (Mithridatic wars 10.71) all describe othismos occurring as a crowd of men attempt to exit a gate. Polybius (4.58.9) describes the Aegiratans routing the Aetolians who fled into a city: “in the confusion that followed the fugitives trampled each other to death at the gates…Archidamus was killed in the struggle and crush at the gates. Of the main body of Aetolians, some were trampled to death…” It is a maxim that most deaths attributed to trampling are in fact due to asphyxia while still standing. The third use of othismos occurs where literal pushing could not occur. When Plutarch (Aristides 9.2) describes ships in othismos, he refers to crowding, not mass pushing. In many cases, “othismos” is completely figurative. Herodotus twice (8.78, 9.26) uses othismos to describe an argument. This is often translated as a “fierce argument”, but traffic terms are commonly used to describe arguments. For example, we regularly call for an arbiter when two sides in negotiation come to an impasse or a log jam. At Plataea, the Tegeans and Athenians (Herodotus 9.26) found themselves at an impasse in negotiations because they both put forth equal claims to an honored place in the army’s formation. The definition of othismos does not of itself require a coordinated push of all ranks against an enemy formation, but I believe there was such a concerted struggle of mass against mass. The orthodoxy portrays hoplites as charging as much as 50 m in order to impart what Schwartz termed “a maximum of penetration power at the collision”. However, the whole notion that hoplites charged like un-horsed medieval knights to maximize the mass’s force during a collision is a fallacy. It takes only a few yards to achieve “ramming speed”, and any excess distance causes fatigue and loss of cohesion. They would be correct if the goal was to maximize the force of one man colliding with another, but the physics of maximizing the aggregate force of a group of individuals is different. Dense packing is far more important to transfer a strong, sustainable force, even if it occurs at slow speed. If a hoplite phalanx charged directly into a pushing of match, it would have closed up all of the men in the files belly to back in the manner I have previously described (Bardunias 2007) and charge from very short range to minimize the loss of cohesion. The common description of othismos as a tug-o-war in reverse leads to some false impressions. The image conjures up men standing perpendicular to their foes, digging in the edge of their rear foot as they lean into the man in front with their shoulders in the bowls of their shields. But in a tug-o-war, the force is transferred through the rope and men can take any stance as long as they pull on the rope. This is not the case with files of men pushing. As men in files pushed against those in front, the force first acted to compress the men in front, and only after they resisted compression could force be transmitted ahead. At moderate levels of compression this was not a problem, but as greater force was transferred forward, the men could no longer hold their shields away from their bodies and shields became pressed to the torsos. If men were standing in a side-on stance as portrayed by the orthodoxy, the force would be transferred directly through the shoulders of each man in file. This was unstable because the only thing holding men perpendicular to their shields was the strength of their left arm. Unless the men closed up laterally belly to back, which is impossible with a meter-wide aspis, the sustained, grinding pressure on their right shoulders would force them to collapse forward until they were parallel to their shields and the men in files were packed belly to back. Once they achieve this spacing and stance, they can be compressed no further and have achieved what specialists on crowd disasters term a “critical density”. This is defined as at least 8 people pressed together with less than 1.5 m of spacing per person. By simply leaning against the man in front like a line of dominoes, 30-75 % of body mass can be conveyed forward in files, and just three leaning men can produce a force of over 792 N or 80 kg. Shock waves can travel through such crowds, and less than 10 people have been shown to generate over 4500 N or 450 kg of force. This has been misunderstood by authors in the past. To counter the objection that the force transferred forward by men in files would be lethal to one’s own file-mates, Franz, as quoted by Schwartz, mistakenly put forth that force is not derived from the weight of them men in file, but from their muscular strength in pushing. This is not true. He further quotes Franz as describing why the files did not produce lethal pressure: “When people behind sense that pushing does not produce an immediate advantage, they stop pushing. This results in a kind of reverse thrust.” This is surely true for most historical armies, where weapon play, not pushing is the goal, but the whole point of othismos as defined by the orthodoxy is to push against the opposite formation with the greatest force. A file of hoplites, even 8 deep, could produce enough force to kill a man through asphyxia. A force of 6227 N will kill if applied for only 15 seconds, while 4-6 minutes of exposure to 1112 N is sufficient to cause asphyxia. Hoplites would be purposefully attempting to create and maintain levels of pressure that occur accidentally in crowds. Killing crowds form when people try to move in a specific direction, such as towards a stage or out a door. Hoplites pushed ahead in file, and if whatever was in front of them did not give way, pressure would rapidly build to lethal levels, and by simply leaning forward they could maintain much of this force for extended periods. There is no requirement for containment such as walls alongside the crowds as we usually see in disasters. As long as they are pushing towards a common goal, in this case directly toward the enemy through the back of the man in front, they will not disperse laterally. The heretics would be correct in assuming that pushing by deep files was not survivable, but for one detail. In my description of the hoplite shield, I put off discussing the single feature of its construction that appears to be unique - the oddly thickened side-walls. As I noted, it appears to primarily add depth, not strength, when compared to other convex shields. It is this depth that allows a man to survive the press of othismos, by protecting his torso from compression. To do so, it would be held directly in front of the body with the top right half of the shield resting on the hoplite’s upper chest and the front of his left shoulder, the bottom on his left thigh. Most of the men in files would have been standing upright and leaning forward. Only the rear few ranks had enough freedom of movement to assume positions that are compatible with active pushing. 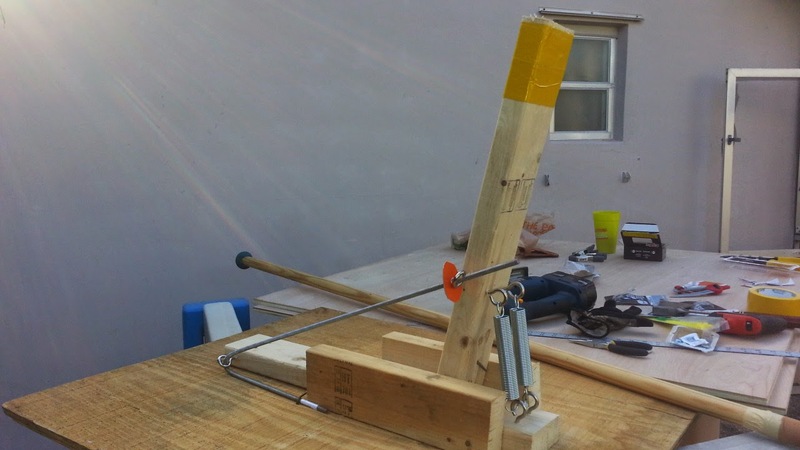 Shock waves of the combined weight of the file would be added to the pushing force in the rear rankers in the same manner that the mass of a battering ram is pushed towards a barrier. Othismos may have originated because men pushed their foes away from fallen leaders to retrieve their corpses and armor. Such struggles are common in the Iliad, and Herodotus used the word othismos to describe the struggle over Leonidas’s body at Thermopylae (7.225). In what may represent an egalitarian shift, victory in hoplite battles generally went to the force that held the battlefield and the bodies of all the fallen men upon it. This could represent a ritualization of warfare, and a means of deciding conflict that minimized slaughter, but it may have been the most efficient means of combat given a preexisting warrior ethos that called large decisive battles and the retrieval casualties. Pushing would have evolved gradually from close-in fighting that predated the aspis. Mass pushing is not unseen in other settings. For example, the Romans pushed with bosses of their shields Zama (Livy), but the shape of the scutum limited the maximum force that could be generated without killing their own men. A sub-lethal, jostling, shoving crowd must have existed before the aspis became specialized for killing crowds. Also, the threat of battle moving to a lethal crowd phase would justify the shape of the shield, even if othismos was not the goal of combat. The shield as “life preserver” in a killing crowd explains the constancy of the shape over time. The deep, flattened dome could not vary much and still retain its ability to resist compression. When the shield was found inadequate protection from missiles, an apron of leather was hung from the round shield rather than remaking the shield into a weaker oval that would provide the same coverage. The remainder of this article describes the course of hoplite battle in Herodotus’s day, reconciling orthodox and heretical views where possible. Athenian hoplites, like those of most poleis, called up amateur levies according to tribal units called taxeis of about 700-1000 men, which was then subdivided into lochoi of 100 or more. The men may have not had set places in ranks, but by this date they probably knew who they stood next to. These taxeis were drawn up alongside one another to form what Thucydides called a parataxeis and others call a phalanx. Spartans provide us with an example of what was possible with a professional army. Their basic tactical unit was the sworn band or enomotia of about 40 men, wherein each man knew his assigned place. Ancient authors usually recorded the number of ranks, or shields, men formed in. This seems to have often been up to the unit commander, and could commonly vary from 4 to 16, with 8 or 12 being the norm for most of the period. Environmental constraints, like a narrow road, could force units to form in deep ranks by stacking smaller units. Thebans in the late 5th and early 4th century notoriously formed in 25 or even 50 ranks for major battles, an obvious advantage for their contingent, but their allies attempted to limit them to 16 ranks in the Corinthian war because the sacrifice in frontage left the whole phalanx vulnerable to envelopment. Once the men were in place, in most armies their leaders would walk along the front haranguing them. Spartans relied on encouragement between hoplites and sang to each other in the ranks. In a prelude to the battle to come, the opposing light troops or cavalry could skirmish in the space between the opposing phalanxes. When the light troops had been recalled and the sacrifices had been taken, the commanders had trumpets, salpinx, sounded and men began marching towards the enemy. At this distance men would have been marching with their spears on their right shoulder and their shields on their left. For comfortable carry, the balance point of the spear should be just beyond the shoulder, and many images show hoplites holding the spear down near the sauroter. Ancient Greek battle fields were notoriously flat and not overly broad which allowed men to keep some semblance of order. As they advanced the hoplites sang the Paian in unison, aiding morale and coordination. Marching in step would have been beyond most armies, but Spartans moved to the sound of pipes to help the men keep pace. At this point men would bring the shield up in front and the command would be passed for the first two ranks to lower spears. This has been interpreted as bringing the spears down to an underarm position, but hoplite reenactors have discovered a simple maneuver to “lower” a dory into the overhand position. They let the spear fall forward off the shoulder while at the same time bringing the rear of the spear out and up. There would be no need to shift the grip later if overhand strikes are desired. When the armies were less than 180 m apart, most phalanxes shouted an ululating war cry to Enyalius and charged at the run. They did so for psychological reasons, both to channel their nervous tension into the attack, and frighten the enemy with their rapid advance. Coordinating the charge along the chain of units that made up the phalanx seems to have been difficult, and gaps often formed as some hoplites charged sooner than others. Variation in speed of advance could lead to one section of the line leaving the rest running to catch up (Xenophon, Anabasis, 1.8.18). Spartans did not charge at the run, but approached in a slow, orderly fashion, so any unit ranged alongside them invariably pulled away when they charged. The result is that a phalanx rarely encountered its opposite as a unified front. For these reasons Thucydides (5.70.1) tells us that large armies break their order are apt to do in the moment of engaging. Thucydides (5.71.1) also describes phalanxes drifting to the right as they advanced because men sought to shelter their unshielded right side. This would have resulted from men twisting their torsos to hold the aspis in front of them. But it is likely that the whole phalanx contracted as well. Bunching as they moved would have been a natural reaction of frightened men as it is with other animals. The Strategikon, attributed to Maurice (12B.17), describes the ease with which men can converge laterally just prior to contact with the enemy. Two approaching phalanxes would end up overlapping on the right through either drift or contraction to the right, and the difference would be difficult to tell. Men who began the charge at a spacing of just over the diameter of their shields might now find that they overlap to some degree with their neighbor’s. Much of the order lost during the charge could be regained as units reformed a battle line upon contact with the enemy. The alternative is that whole taxeis ran tens of meters past units next to them in line that were engaged when the foes opposite were delayed or slow moving Spartans. The two phalanxes would have slowed as the enemy loomed large. The same fear that drove them to charge would keep them from running blindly into a hedge of enemy spears. Because disorganized men charging at speed into the enemy results in a weaker mass collision, there is no reason why men could not halt at spear range rather than after crashing together. If men did not regularly stop and fight with their spears, then it is difficult to understand the many references to one phalanx breaking when the two had closed to spear range. Hoplites converging at even a modest 5 mph would cover this distance in less than half a second. What followed was described by Sophocles (Antigone, 670) as a “storm of spears”. While taunting their foes, the first two ranks of the opposing phalanxes would assume the ¾ stance common to most combat arts and strike overhand across a gap of about the 1.5 m reach of a dory. The overhand motion results in a much stronger thrust than stabbing underhand (Connolly, 2001), and would be less likely to impale the men behind. When striking from behind a wall of shields, the overhand strike not only ensured that your arm was always above the line of shields but allowed a wide range of targets. During this combat adjacent hoplites were mutually supporting, and a man could be killed through the failure of those alongside him (Euripides, Heracles 190). The second rankers would have attacked where they could reach, but their spears also acted to defend the men in front. The aspis would have been tilted up and toward the enemy. With the shield snug on the forearm, this would be the natural result of lifting the arm, but it also presents the maximum shield area to a downward, overhand strike. 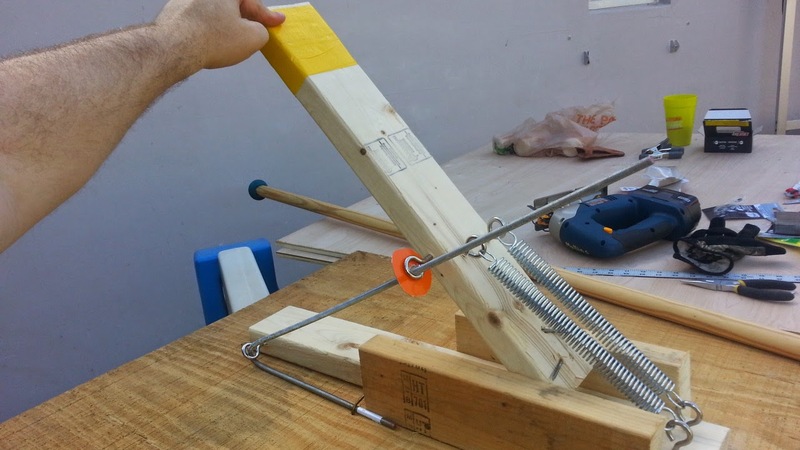 In this position, the shoulder doesn’t bear any of the weight because the centrally placed porpax results in the lower half of the shield balancing the upper half with all the weight on the arm. It can be braced against the shoulder if pushed back by a strike. Spear fighting could go on for some time, and often one side must have given way as a result, but we know that battles could move to close range. It is difficult to imagine men easily forcing their way through multiple ranks of massed spears, but we know that hoplites often broke their spears, and a sword armed man would be highly motivated to close within the reach of his foe’s spear. Perhaps this was easier as fatigue set in. Once swordsmen closed with the spearmen somewhere along the line, phalanxes could collapse into each other like a zipper closing as spearmen abandoned their useless spears in favor of their own swords. It is now that rear rankers could bring their pressure to bear. They would close up swiftly, initially supporting those in front, but then gradually pushing them tight together. All ranks would now cover their chests with their shields. While this was occurring the front rankers fought, and their blows could not miss (Xenophon, Anabasis, 2.1.16). 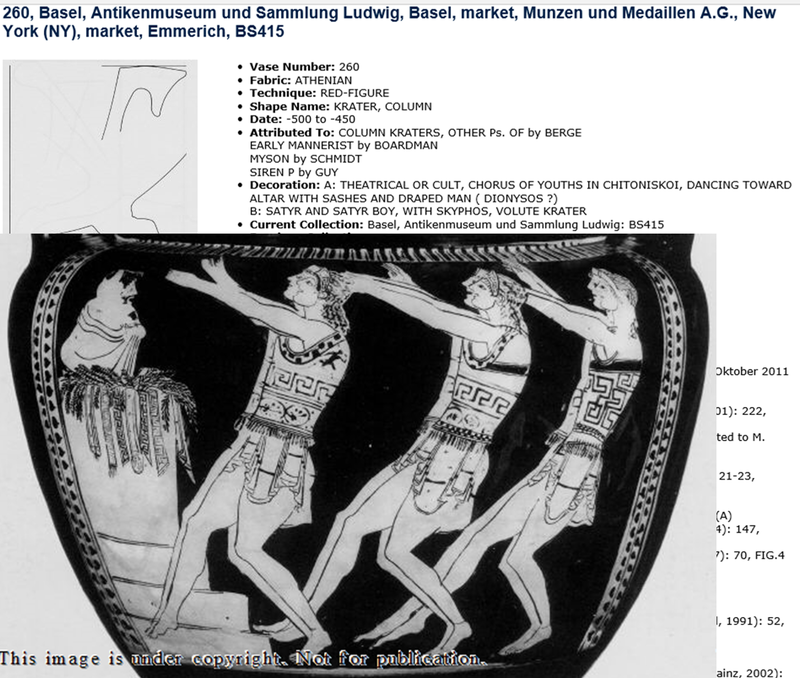 Images of hoplites show a variety of strikes that could be used with the upraised right arm over the shields. The so-called “Harmodios blow” is a high slash from around the head that has been derided as useless, but here strikes and parries up around the head would be the rule. Point heavy chopping swords would be useful in othismos, but the short swords, often attributed to Sparta and seen on stelai from Athens and Boeotia, would be deadly. A downward stab, alongside the neck, into the chest cavity can be seen on a vase in the Museo Nazionale de Spina (T1039A). The crowding of othismos and periods of active, intense pushing could last for a long time as men leaned ahead like weary wrestlers. But the peak pressure is only maintained if the opposing phalanx chooses to resist it. If they move back, their foes have to pack-in tight again before maximum force can be transferred. All such moves have to start at the back of the files, there is no point at which a man could simply jump back and his enemy would fall forward. Just as packing was gradual, so is unpacking. The whole mass would move in spasms and waves like an earthworm. Increased file depth is an advantage in this type of contest, but the answer to those who wonder how why at Leuktra 50 ranks of Thebans didn’t immediately drive 12 ranks of Spartans from the field rests in the difficulty in coordinating such deep files of men to push in unison and the need to constantly repack as men advance. Deep ranks function more like a wall behind those in front than an aid is pushing forwards. When hoplites could no longer sustain the rigors of pushing, the rear ranks of the phalanx would turn and flee. What followed could be a free for all as men broke ranks to target the backs of routed foes. It is now that lessons of hoplomachoi, martial arts masters, were of most use (Plato, Laches 182a). Men who had been holding up their arms throughout battle would surely opt for underhand strikes at this point as seen for single combat on many vases. Hoplites did not press pursuit for long, so many saved their lives by dropping their shields and spears and outpacing those chasing them. Safer still was making a stand with compatriots and letting the victorious hoplites find easier prey as Socrates did after Delium (Plato Symposium 221b). Hoplite battle encompassed both the storm of spears and press of shields, but by the late 5th century clever generals were coming up with ways of exploiting the weaknesses of both phases of combat. Envelopments and ultra-deep formations took advantage of the weaknesses of armies set on simply fighting a decisive battle with units arrayed opposite them, often with little regard for flank protection. A century later hoplites would lose their supremacy to Macedonian pikemen, themselves up-armored skirmishers, who presented them with spears that far outranged the dory and only a dense hedge of spear points to push against. Paul Bardunias is an entomologist working on self-organized group behavior in termites and ants. His interest in ancient warfare is hereditary, for his family comes from Sparta. He is currently applying his scientific training to provide new insights into hoplite combat at www.hollow-lakedaimon.blogspot.com. He is indebted to Russian hooligans, whose tireless shenanigans allow us to witness the fluidity and spontaneous order that arises in crowds of belligerent men (http://www.youtube.com/watch?v=dAk4dceoK4&feature=related). P. Bardunias, ‘The aspis. Surviving Hoplite Battle’, in: Ancient Warfare I.3 (2007), 11-14. G.L. Cawkwell, ‘Orthodoxy and Hoplites’, in The Classical Quarterly 39 (1989), 375-389. 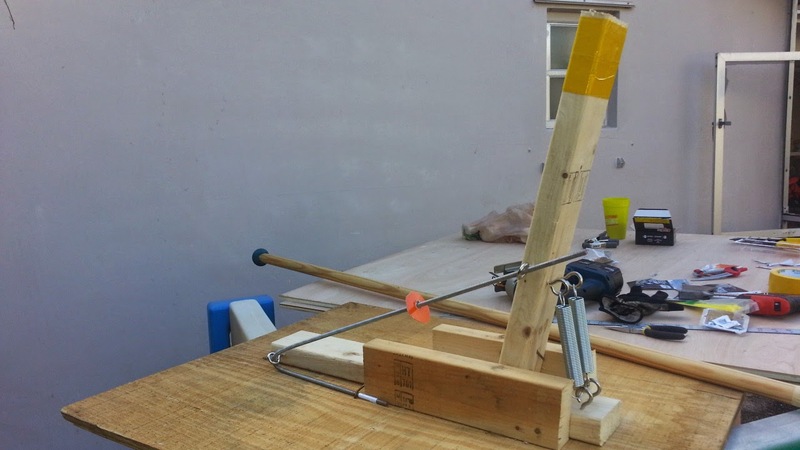 P. Connolly, D. Sim, and C. Watson, “An Evaluation of the Effectiveness of Three Methods of Spear Grip Used In Antiquity”, in: Journal of Battlefield Technology, Vol. 4, No. 2, July 2001. A.K. Goldsworthy, ‘The Othismos, Myths and Heresies: The Nature of Hoplite Battle’, in War and History 4 (1997), 1-26. V.D. Hanson, The Western Way of War. Oxford 1989. V.D. Hanson (ed. ), Hoplites. The Classical Greek Battle Experience. London and New York 1991. P. Krentz, ‘The Nature of Hoplite Battle’, in: Classical Antiquity 16 (1985), 50-61. P. Krentz, ‘Continuing the othismos on the othismos’, in Ancient History Bulletin 8 (1994), 45-9. P. Krentz, D. Kagan and D. Showalter, The Battle of Marathon. Yale University Press (2010). R.D. Luginbill, ‘Othismos: the importance of the mass-shove in hoplite warfare’, in: Phoenix 48 (1994), 51-61. H. van Wees, Greek Warfare. Myths and Realities. London 2004.